In this post, you will find the Peruvian drone laws. For a long time, the import of a drone to Peru was only possible with the permission of the Ministerio de Transporte y Comunicaciones (MTC). The application had to be made personally on site and will be processed within 5-7 working days. Meanwhile, it looks as though the authorities have distanced themselves from this rule. According to recent reports, this permission is no longer required, and it is relatively easy to use the drone in Peru. Note, however, upon entry, that you must specify your copter on the customs form, otherwise threatening US $ 250 penalty. In customs, you have to deposit about 18% of the purchase value as a deposit, which you get back on your departure. The deposit serves as a VAT if the drone should stay in the country. The refund at the airport takes 1-2 hours. So plan enough time at the airport on your departure! While it may not seem necessary, you should only travel to Peru with valid drone insurance. At religious sites and on Machu Picchu, flying a drone is prohibited. Anyway, in Peru, there are undoubtedly many beautiful places with beautiful motives. 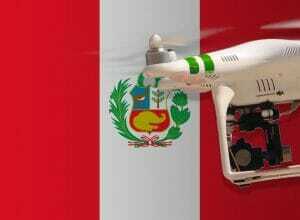 We have researched the listed drone regulations for Peru to the best of our knowledge. We cannot guarantee the correctness of the information. If you want to be on the safe side, contact the competent aviation authority. Alternatively, you can also ask the embassy in your country for further information about the regulations. Please leave us a comment when you receive news and/or gain experience with your copter in Peru! Any way to get a permit to fly a drone Machu Picchu? Can you fly it around the town of Aguas Calientes? How long does it take to get tax refund when you leave. We only have about two and half hour connecting when we leave. is that enough time? For what it’s worth I just took my Mavic Pro. No one at the airport said anything coming or going and neither did I. I was fine. Nothing paid.